Acceptance of feed enzyme technology has increased in the United States over the past twenty years. Feed enzymes have become an important tool to increase the nutritional value of feed ingredients, reduce feed costs, improve the environment, all while maintaining or improving animal performance. Enzymes, by definition, are chemicals or catalysts released by cells to speed up specific chemical reactions. This definition accounts for enzymes released in the digestive tract to aid in the digestion of food. Today, these same enzymes can be effectively manufactured and added to animal feeds. Three classes of enzymes (phytases, carbohydrases, and proteases) are typically considered for use in poultry feeds. This article will briefly discuss the purpose of each class and their applicability to poultry feeds. Phytase products were first introduced in the early 1990’s. Most producers are aware of and are typically using phytase in poultry diets. Legislation to decrease phosphorus pollution in some states has contributed to the increased usage of phytase. Phytase works by releasing some of the nondigestible phosphorus (and other nutrients) found in commonly used feed ingredients and making the nutrients available for productive purposes. Phytase is a proven technology used to reduce feed cost by reducing inorganic phosphorus supplementation and has the added benefit of decreasing phosphorus excretion in manure. Carbohydrase enzymes have been proven to be effective in increasing the amount of energy available from feed ingredients. Key carbohydrase enzymes include amylase and xylanase and are used to improve the digestibility of carbohydrates in feed ingredients. This improved digestibility increases the availability of energy in the small intestine to help promote growth and other productive processes. Corn provides a majority of the energy in a typical poultry diet. Amylase is a starch digesting enzyme that helps to digest more of the starch found in corn. Amylase increases starch digestibility, thus providing more available energy. Xylanase, on the other hand, releases energy from the fibrous portion of grains and grain byproducts. Protease is a protein digesting enzyme that breaks down storage proteins binding starch within feed ingredients. This makes the energy from protein bound starch available to the bird to be used for productive purposes. Proteases are also effective in releasing protein anti-nutrients found in ingredients like soybean meal. This function of proteases makes proteins more available. A combination of amylase, xylanase, and protease enzymes working together to each attack different poorly digestible portions of feed ingredients increases energy available for growth and/or egg production. The addition of these three enzymes to the diet in combination typically increases energy available to birds by 3 to 5%. Since energy is the most expensive nutrient in the diet, the addition of amylase, xylanase, and protease enzymes to poultry diets provides producers the opportunity to reduce feed costs. Typically, enzyme supplementation costs around $1.50 per ton of feed. However, feed costs can be reduced by $2.50 per ton in lower energy layer diets to over $4.00 per ton in high energy turkey diets. Wenger Feeds utilizes phytase and a combination of amylase, xylanase, and protease enzymes in all Wenger Feeds poultry feeds. The combination of these enzymes reduces feed cost by $5.00 to $8.00 per ton. Actual savings depends on feed ingredient prices with increased savings as feed ingredient prices increase. 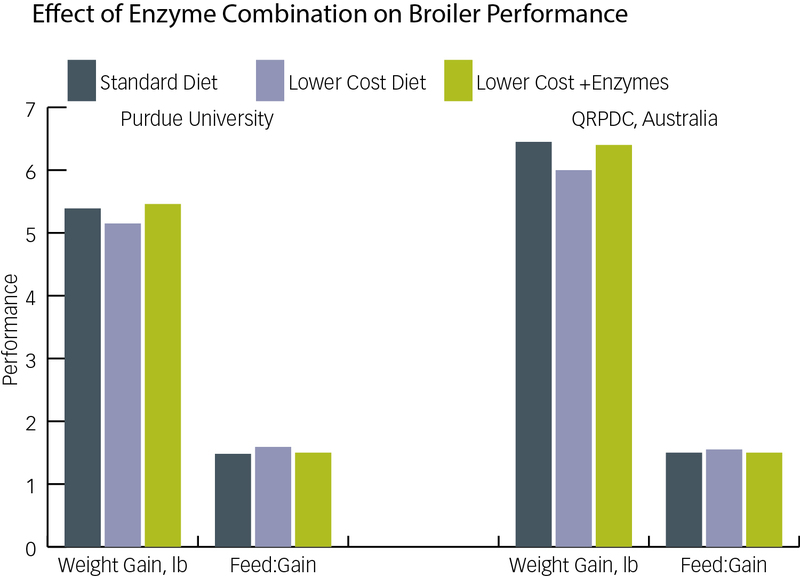 The following chart from research conducted at Purdue University and QRPDC in Australia shows the effect of adding the combination of xylanase, amylase, protease, and phytase to a lower cost diet on broiler performance. The formulation of a lower cost diet compared to the standard diet reduced growth rate and the efficiency of feed utilization. However, with the addition of the enzyme combination to the lower cost diet, growth rate and feed conversion were equal to the standard diet. The use of enzymes in poultry feeds has gained more acceptance by producers over the past twenty years in the United States. The use of feed enzymes in poultry feed allow producers to benefit from advances in enzyme technology in today’s competitive and challenging market. For more information on Wenger Feeds’ Products and Services, contact us.